Josh James was not around Saturday to get the win in his big league debut but, thanks to a five-run rally in the eighth, he can say his new team won his big league debut. The final was 7-3 which snapped a two-game losing streak and boosted the Astros back to a 2-1/2 game lead over Oakland in the A.L. West. James was one of four players the Astros added to their roster Saturday as teams were allowed to expand past the 25-man limit of the first five months. Catcher Brian McCann and outfield Jake Marisnick were activated from the disabled list while James and lefty reliever Cionel Perez were called up from minor league affiliates. James, a righthander whose calling card is his strikeouts, whiffed nine batters in five innings of work, allowing three hits and one walk. One of those hits, though, was a three-run homer by Kole Calhoun which put him behind, 3-1, when he made his exit. James buzzed Calhoun with a fastball clocked at 101.1 mph to open the game. Calhoun got his revenge in the second after a walk and a single opened the frame. Two outs later, Calhoun yanked one into the right field stands about six rows deep. 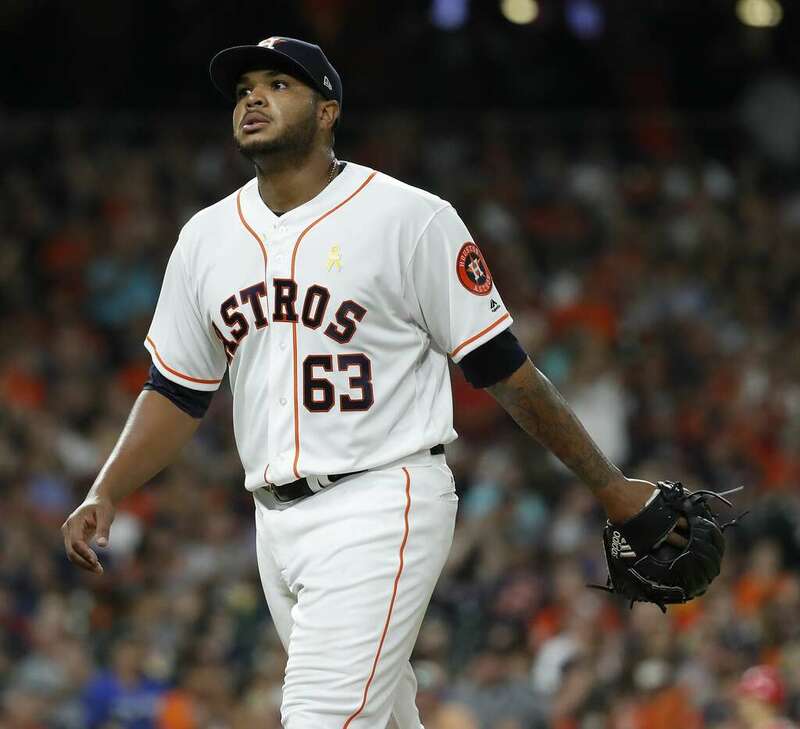 McCann, his batterymate, got Houston on the board with a sacrifice fly in the third and Alex Bregman, the club leader in hits, runs, doubles, homers and RBIs, smashed a drive into the Crawford Boxes off starter Felix Pena in the sixth to draw the Astros within 3-2. Pena lasted seven innings and gave up just five hits. Cam Bedrosian took over in the eighth and that was the Astros' sign to go to work or suffer their third straight loss. Tony Kemp started with a single up the middle. George Springer reached on catcher interference. Two outs later, Carlos Correa smacked a base hit over short to drive home Kemp and tie the game. Tyler White ripped a double off the scoreboard in left that cleared the bases for a 5-3 lead then a fly to left center by Marwin Gonzalez was misplayed by Eric Young Jr. into another two runs. Former Angel Joe Smith was the beneficiary of the largess and Roberto Osuna locked down the ninth to seal the occasion. Elsewhere, Seattle edged the Athletics, 7-6, to extend Houston's lead in the division. The series finale was switched to a night game to benefit ESPN so the Sunday contest will be at 7:05 pm Central with Shohei Ohtani (4-1) making his first pitching appearance singe June with Gerrit Cole (12-5) going for the split for the Astros. More call-ups are likely as September moves on with Kyle Tucker presumably one of them once Fresno's season comes to a close.